Oreo, aka Dewey Oreo, is a fun-loving 3-year-old who looks just like the picture that comes to mind of a dog named Oreo. 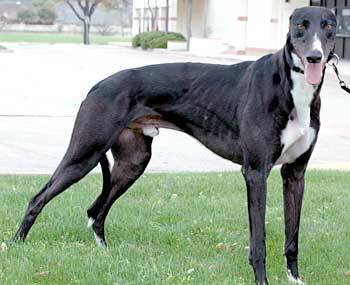 A big playful boy, Oreo was born on August 16, 2002 to sire Oshkosh Slammer and dam Pnp Berttheflirt. Oreo's career began in July of 2004 at the Dairlyland track in Wisconsin, where he moved up the ranks to become a Grade A racer. From there he headed south to Texas and the Valley track in Harlingen. Oreo sustained a break to his stopper, an area near the wrist, but the injury has completely healed. Now an official retiree, Oreo is looking forward to all the comforts of home and lots of love from his lucky family. Oreo is cat tolerant. 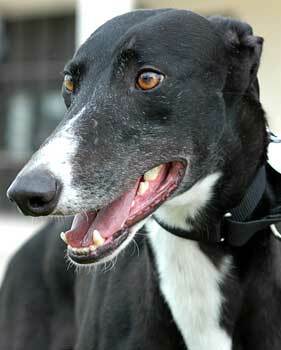 Oreo is as sweet and classic a greyhound as the cookie he's named after. He's very affectionate and soaks up the loving like a sponge. He's very playful first thing in the morning after doing his "business"outside, entertaining himself with squeaky and giggle toys. Chasing squirrels is another favorite pastime. As is typical of greyhounds, he wants to be where his human is and gazes at me with his soulful chocolate brown eyes when I'm rubbing his ears and neck. Oreo took to the home environment very quickly. 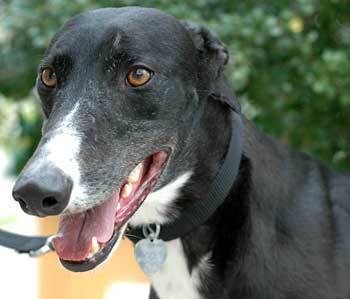 He is quite friendly with the cats and gets along nicely with his foster canine sibs, another grey and a terrier mix. Come meet this adorable boy and see if he doesn't just melt your heart!